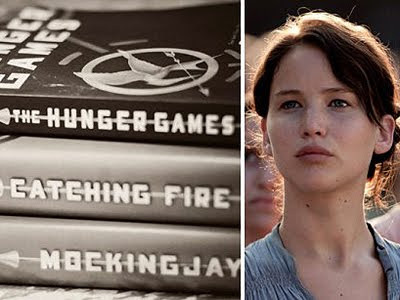 So the Hunger Games movie it out! My tweenage niece and nephew were at the midnight showing and I still haven’t see it! Oh, the horror of having a baby and having to work around a sitter’s schedule. But in preparation for my viewing next weekend, I’ve reread the book. Embarrassingly, I still cried at the Rue scene even though I knew it was coming—but that’s how awesome the novel is. I can only pray the movie stacks up, which brings me to this question: what are your thoughts on watching a movie before reading the book? I’ve done this a few times. Most notably, I saw In Her Shoes in the theater before reading the book—primarily because the movie was filmed in Philly and I’m a sucker for all things Philadelphia. The movie was cute, but I found that when I finally read the novel, predictably, it was like slugging through a rerun. I already knew what was going to happen, and when the novel differed from the movie, I found it irritating—when it should be other way around. However, recently, I found watching the movie first useful. 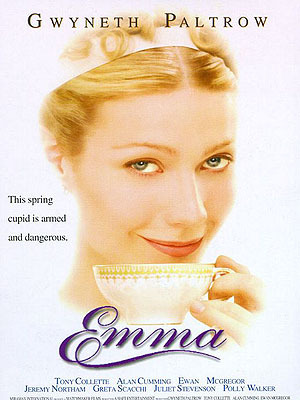 I’ve been reading Jane Austen’s Emma, and for some reason, I’m just not that into it. The book is very much about social standing, and the main character often gets exasperated with her conversations with others, especially those of lower standing. Well, I’ve been finding myself just as exasperated with her conversations—some go on for pages and pages and are about nothing more than a piano or a trip to the post office. So I watched the movie this weekend (the Gwyneth version) and it helped renew my interest—the conversations were much less annoying when condensed to movie lengthy and even though I found the casting odd (Toni Colette playing a character who’s supposed to be much younger than Gwyneth? ), I found their interpretations of the characters helpful in getting me to better enjoy the book.